On our drive between Madrid and San Sebastian, we couldn't miss a visit to the famous wine region of Rioja, which straddles the states of Basque, Aragon, Navarre and Castilla y Leon and sits on a plateau of high altitude, where the noble Tempranillo grape thrives in the dry and arid environment. 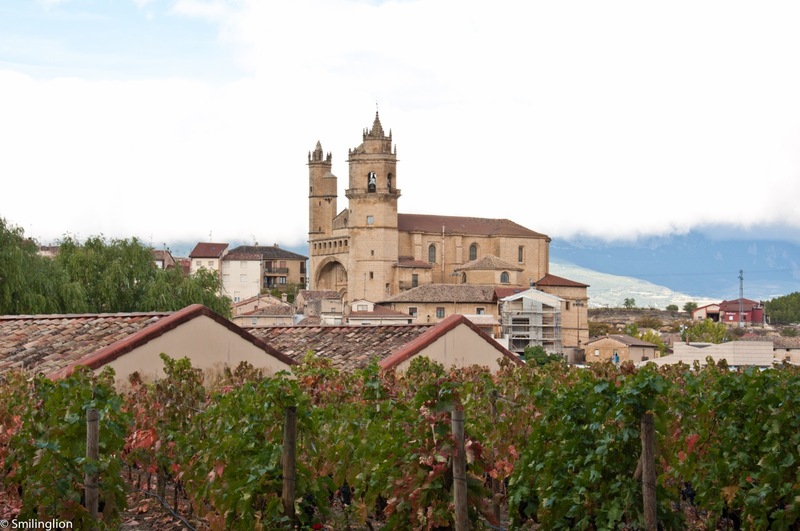 We were surprised by the desert landscape, as we would have expected a more green and fertile land for such a major wine region. The scenery was beautiful though, with the area surrounded by mountain ranges and small hamlets springing out around old churches. Nestled in the heart of Rioja country, with its curved and shiny steel structure dominating the landscape, is the Marquis de Riscal Hotel and Restaurant, an establishment which is part of the renowned wine producer of the same name. 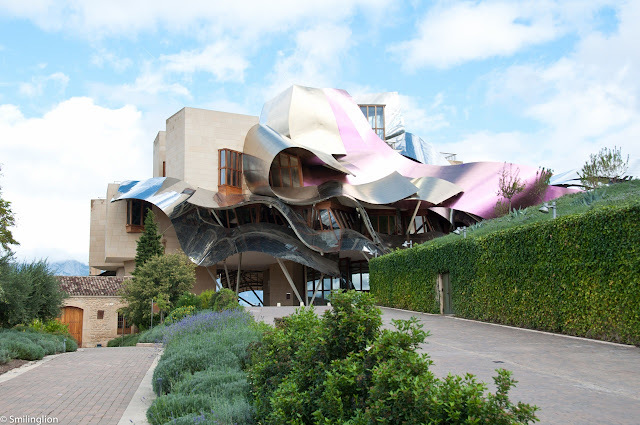 Designed by the famous architect Frank Gehry, it is incongruous with the ancient surroundings yet daring in its design. 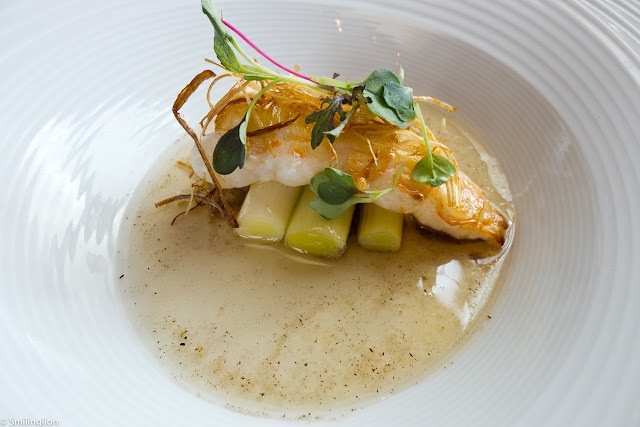 The five star hotel is a member of the Starwood Luxury Collection and the one Michelin starred restaurant is helmed by young Chef Francis Paniego. We didn't have the privilege of staying here this time but was certainly looking forward to lunch at the restaurant. 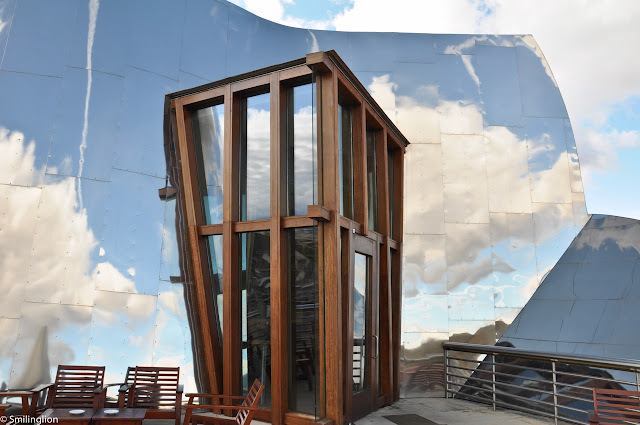 In line with Frank Gehry's tendency to shock the senses, it was no surprise to us that the interior of the restaurant was all red, with acute corners (which actually served the purpose of creating many private dining spaces) and unsymmetrical windows. 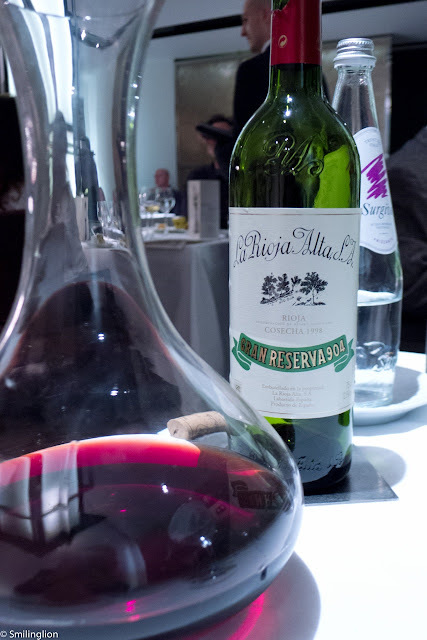 It was a no-brainer for us to order the 'in-house' wine, and we picked the special anniversary edition of the 2001 Reserva produced by Marques de Riscal. 2001 being one of the best vintages for the Rioja wines, this bottle didn't disappoint, and furthermore was a steal at EUR50 only. Seed tile and black olive bread: The seed tile was amazing, it was sunflower seeds on a thin breadstick and we couldn't have enough of it. 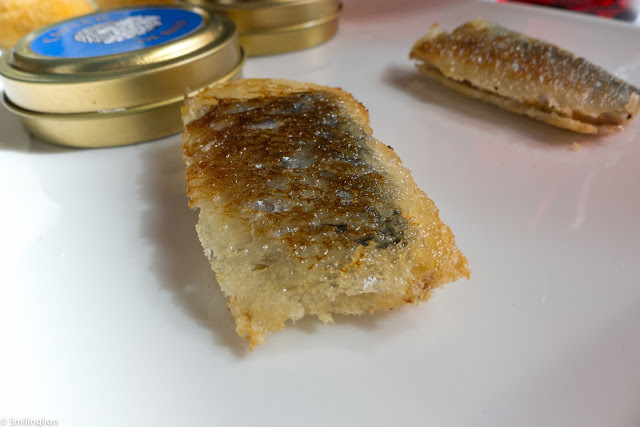 Sardine, bread and cheese: This was very good classic finger food. 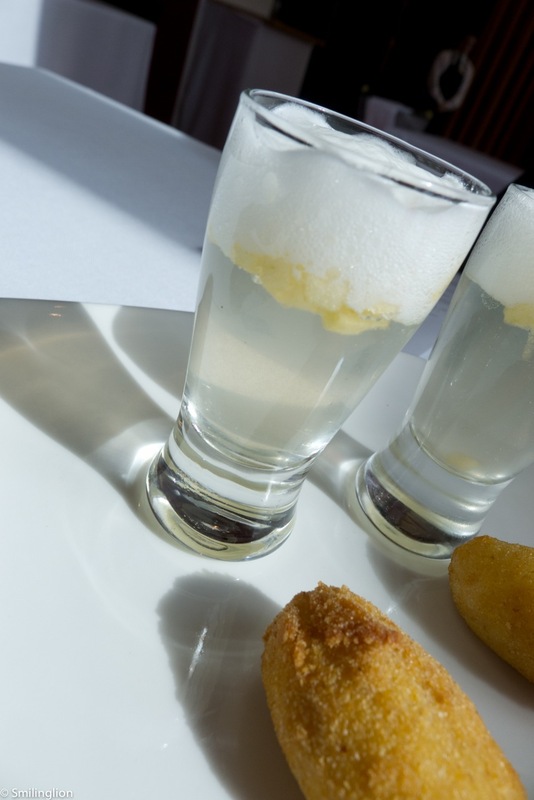 Tomato juice presented as a small beer, the "Eschaurren" croquettes: This was a unique take on the clear tomato essence, as it was frothed like beer. 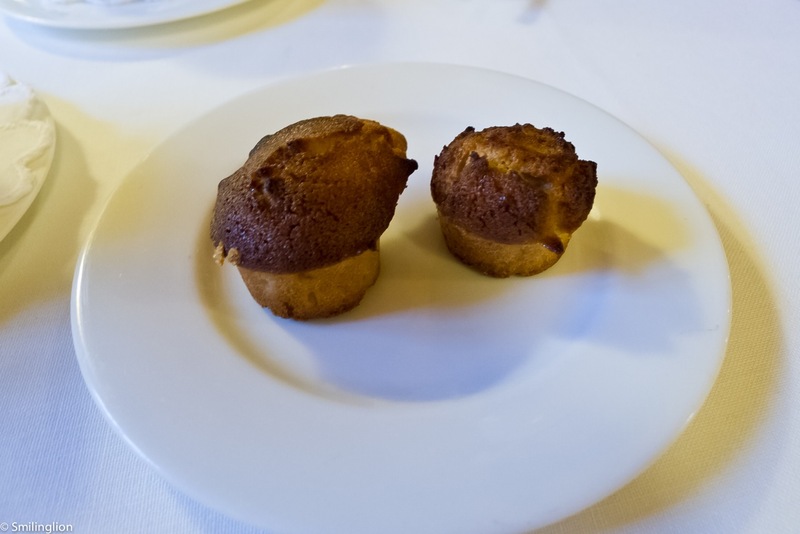 The croquettes were a classic tapas dish which was also very good. 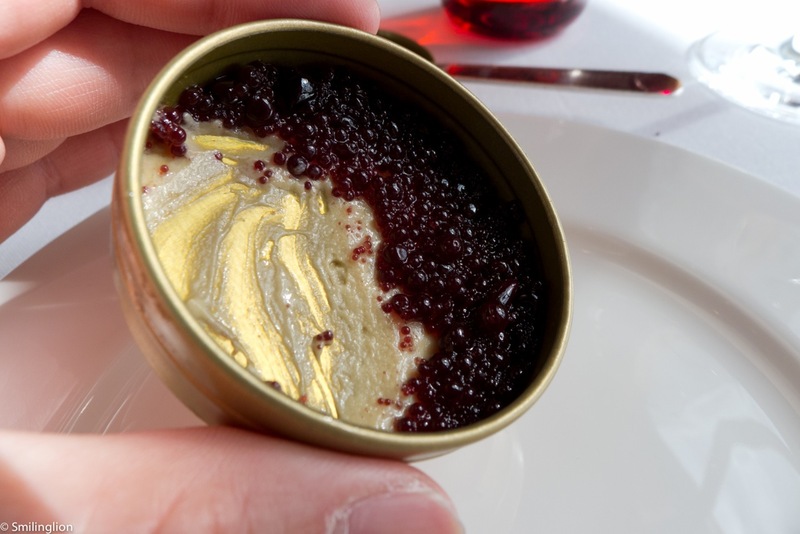 Red wine caviar: The red wine cavier on a bed of foie gras was a brilliant appetiser. 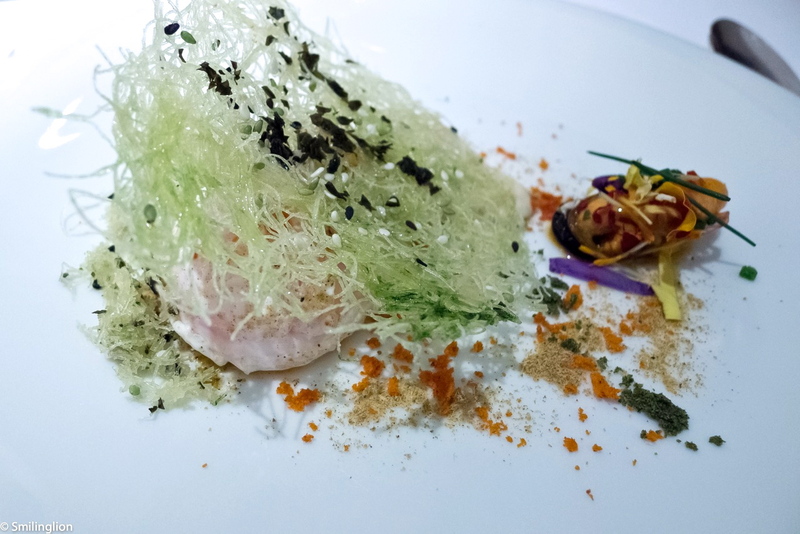 Red shrimp carpaccio over a tomato tartar and white garlic sauce: The combination of the three layers (garlic, tomato and raw shrimp) topped by some red wine caviar was quite inspired. 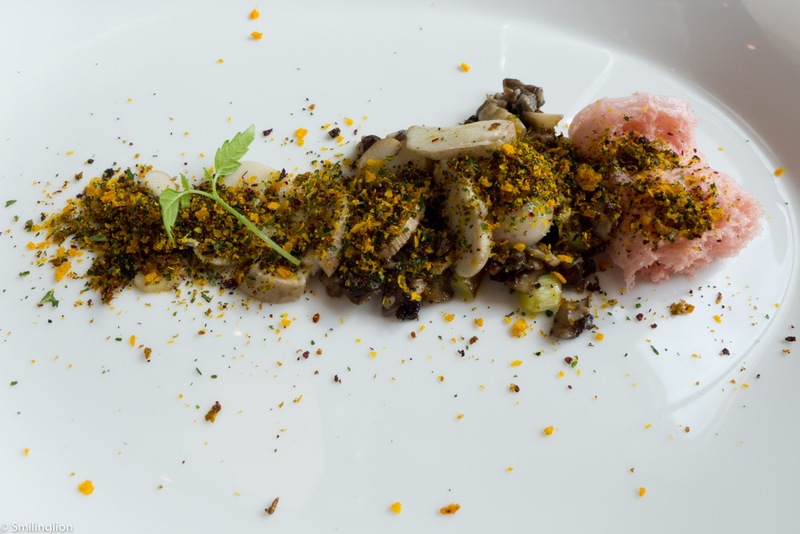 Under a dry leaf blanket (representing a walk through the forest): This was an earthy dish of mushrooms and a variety of ground herbs. 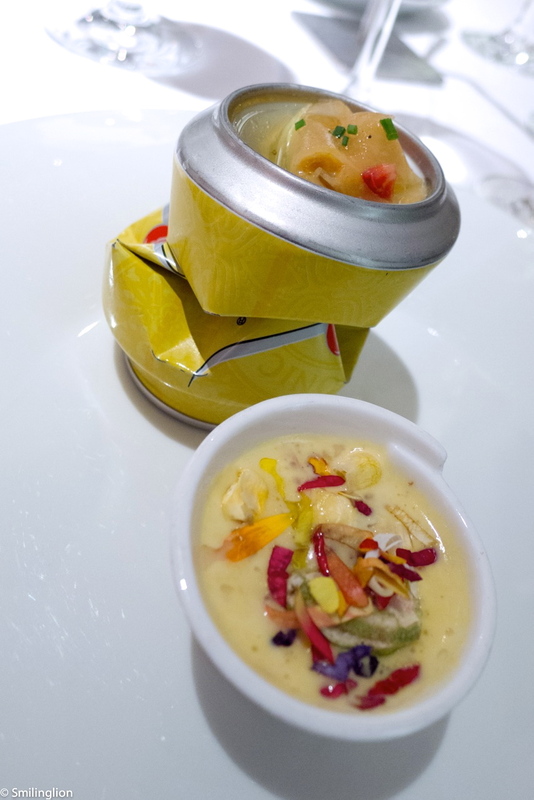 It was very well put together and was a good representation of the name of the dish. Galician lobster with roasted leek and its own clarified broth: We thought the clear lobster broth was interesting and it complemented the lobster and leek well. 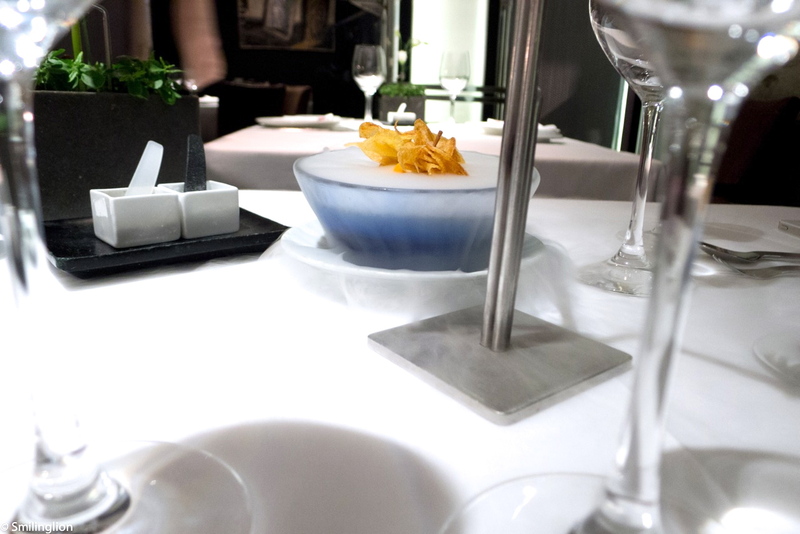 Ghery's farm egg - Candied crystal peppers, farm egg coked at low temperature and gold pepper's nectar: This was poached egg with candied sheets which were of the colour scheme of the building. Phi-phi cod, over candied green pepper and onion with pasteurized yolk: This was a decent fish course, although we felt that it was a bit too mushy and lacked structure. 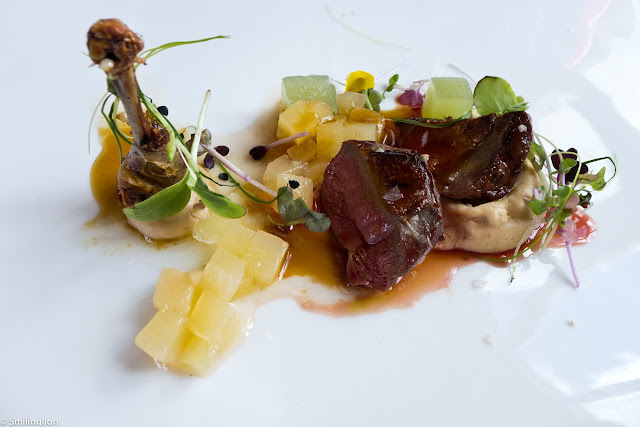 Roasted young pigeon over pear and lime concasse: The pigeon was good but we felt the fruit pieces were a bit too tart and slightly overpowered the meat. 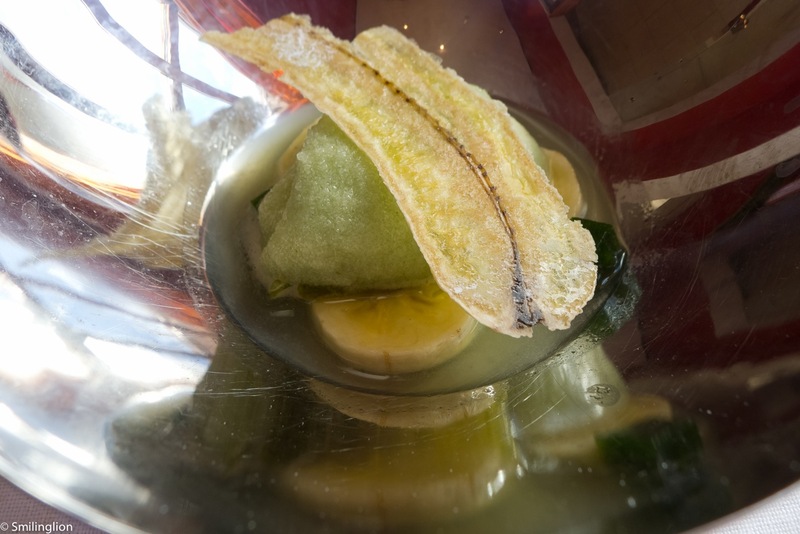 Mojito with banana and mint: Lime and mint sorbet which was refreshing. Sweet toast with "Cameros" cheese, green apple and honey ice cream: This was an amalgamation of the cheese and dessert courses, and it worked quite well. After lunch, we were brought upstairs to the rooftop terrace to enjoy our coffee. 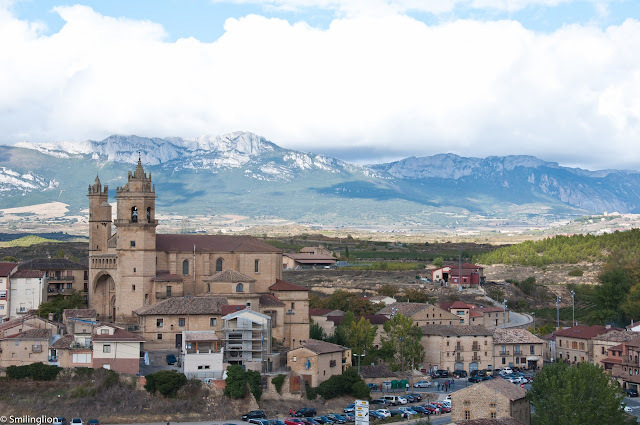 The views from the roof of the countryside were spectacular. Impressions: It was a very enjoyable meal, and though the main courses were less impressive than the appetisers, overall we thought the quality of the cooking and the excellent service we received that afternoon were of a high standard. It was quite an experience dining in such a landmark of cutting edge design, in an otherwise desert-like area sparsely populated by old towns and dusty roads. 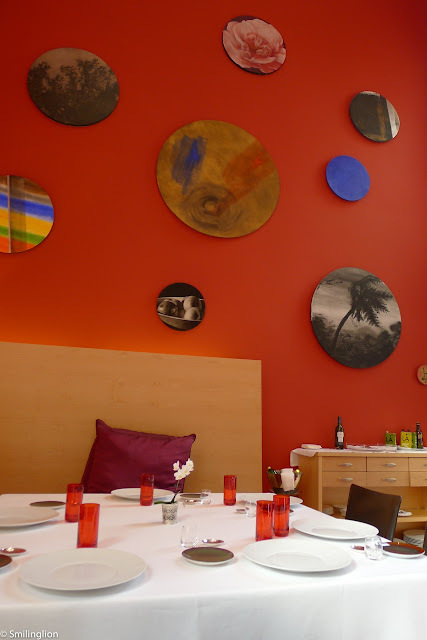 A stay at the hotel will definitely be in our agenda the next time we are here. 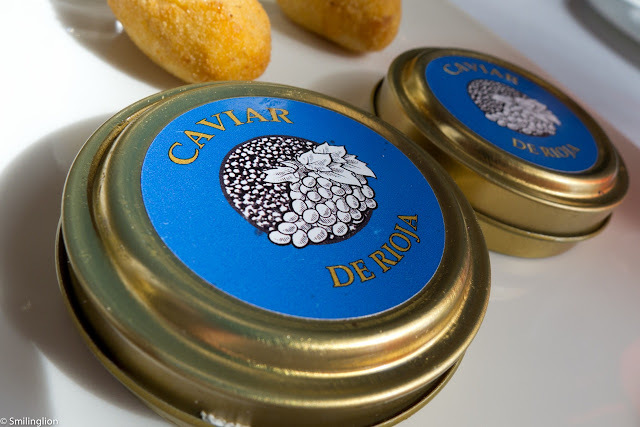 Three Michelin stars, San Pellegrino's 8th best restaurant in the world in 2012 and chef Elena Arzak winning best female chef in the same year; Arzak has the credentials to be regarded one of Europe's top restaurants. 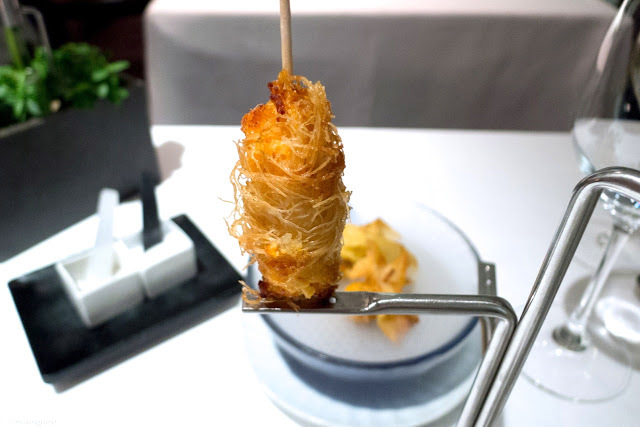 Chef Elena runs the kitchen together with her legendary father, Juan Mari Arzak, in a two-storey tavern along a busy main road in San Sebastian. 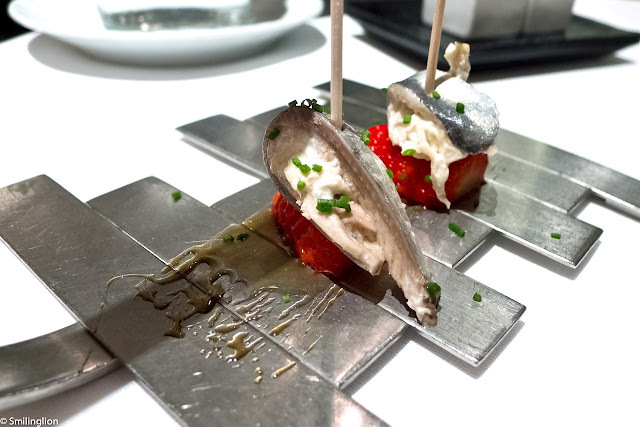 The day we were there was also the last of the week-long Gastronomika held in the same town, an event which celebrated some of the best chefs in the world, and given the crowd of foodies in San Sebastian that week, expectations were high when we scored a reservation here. It was set up to be one of our best meals ever. Except that it wasn't. 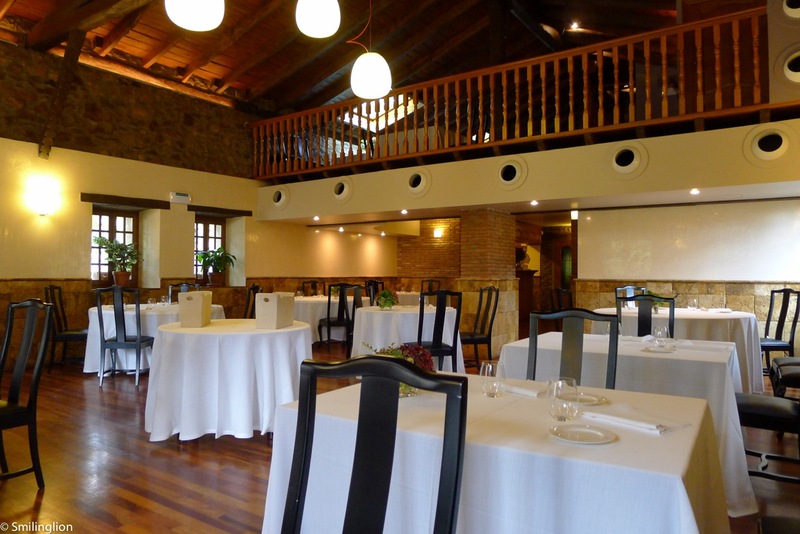 The dining room was nice and the table settings and service were as impeccable as can be expected from an establishment of such standing, but it was to be probably our most disappointing meal during our 2 week trip in Spain. The wine we picked for the dinner was a 1998 Grand Reserva La Rioja Alta, which was supposedly the more premium version of the 2001 Vina Ardenza Reservav (which we had at Sant Celoni a week before). But the 2001 being the better vintage, we actually preferred the latter. 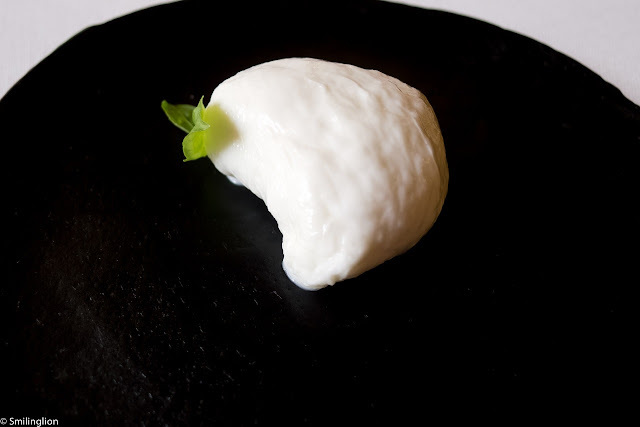 Gooseberry with coconut. 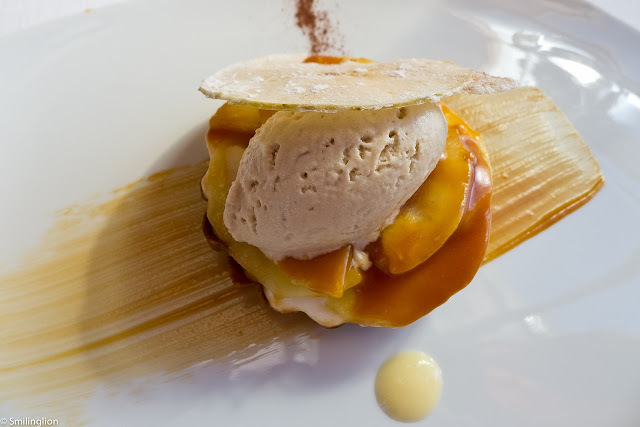 Kabraroka pudding with kataifi. 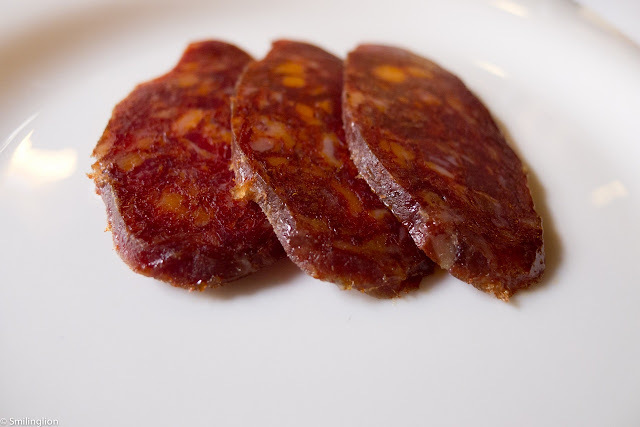 Chorizo with tonic, and corn, figs and black pudding: The meal started very well. 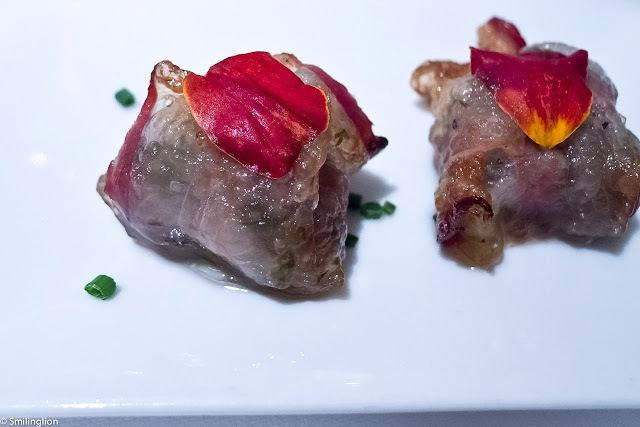 In particular, of the amuse bouche, the kabraroka (a kind of fish) wrapped in a vermicelli-like pastry was excellent. Marinated sardines with strawberry: The appetizers continued to impress, in this case, the tartness of the strawberries proved an interesting balance to the fishiness of the sardines. 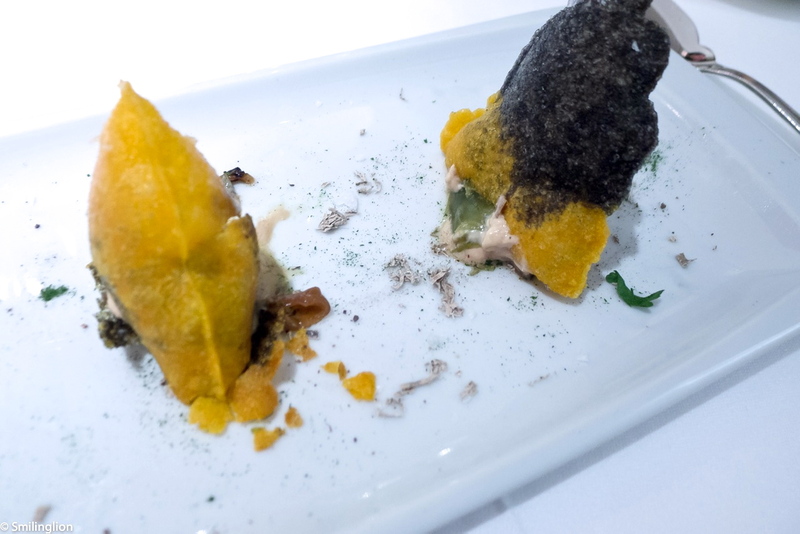 Cromlech with onion, coffee and tea: The next course was a crispy cromlech (a kind of monolith which had the texture of deepfried wonton skin) filled with onion confit with a dash of coffee and tea powder, which was very good. 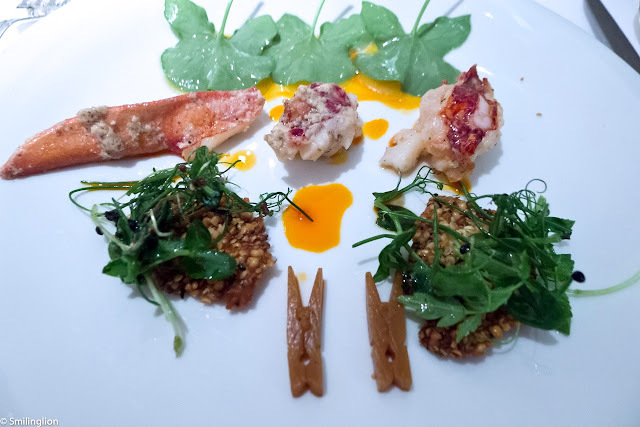 Hemp's mustard and lobster, tapioca salad with citrus: We thought the lobster portions in this dish were too small to really make much of an impact. 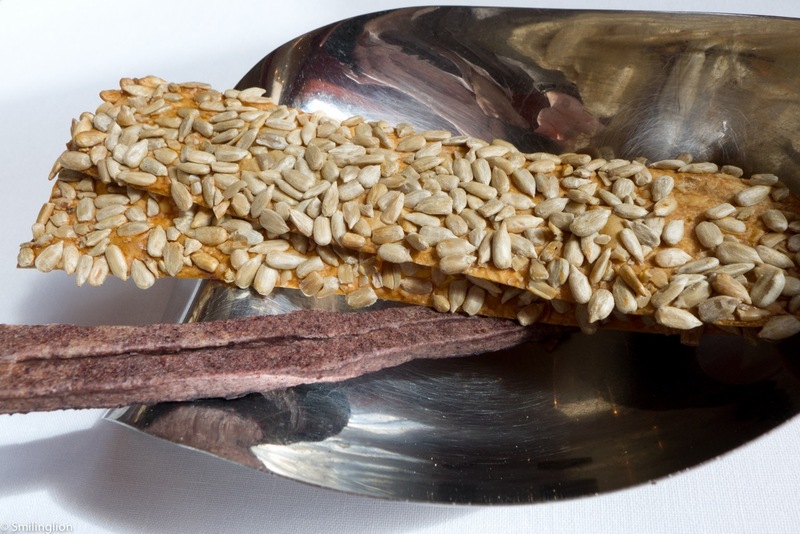 The mustard seed crackers were interesting but otherwise the dish fell flat. 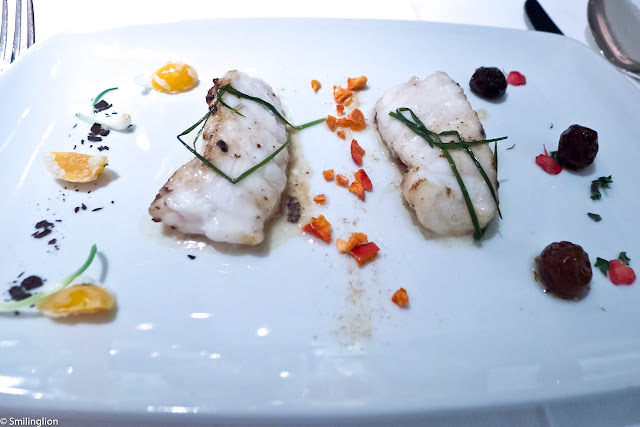 Gooseberry, spelt and monkfish: The berries and monkfish formed a perfect combination. The dish worked. Pork fat and physalis: We were not impressed with this dish, which essentially was bacon and petals of a flower. 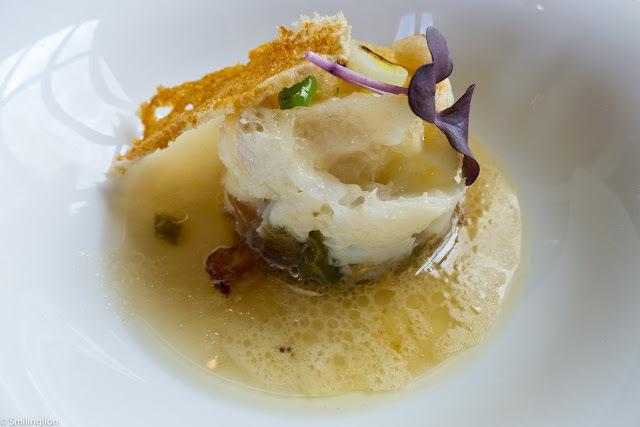 Dusted egg and mussel: This was one of the rare dishes which turned out very well. 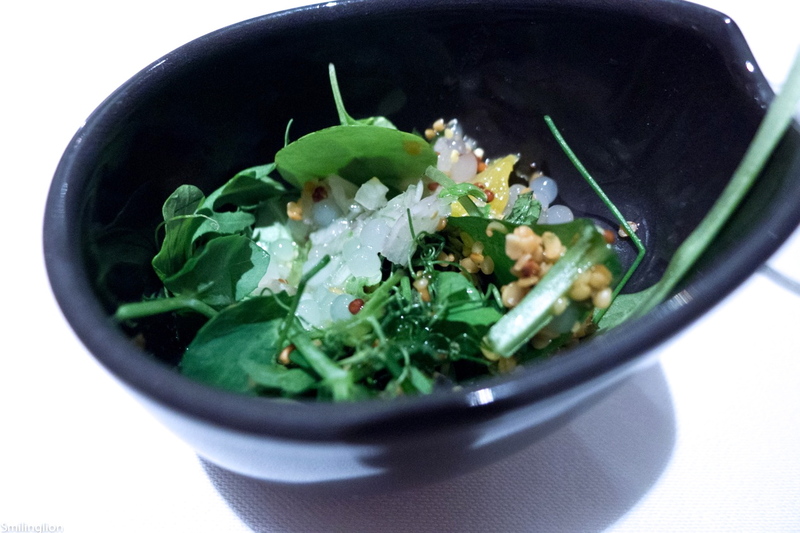 It was a poached egg and a mussel flavoured with various different powdered herbs. 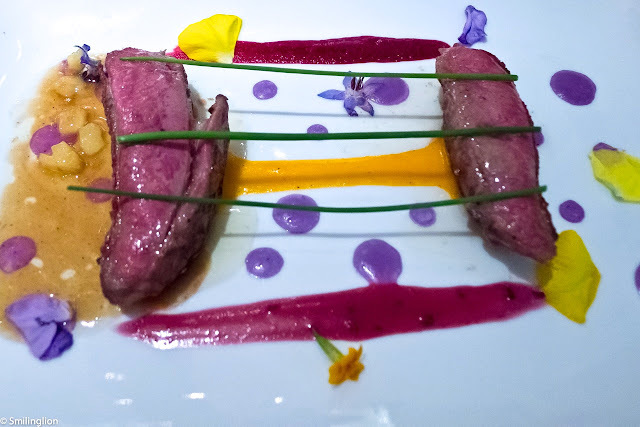 Pigeon with anthocyanin: The pigeon breast garnished with a variety of colourful pigments was pretty good. 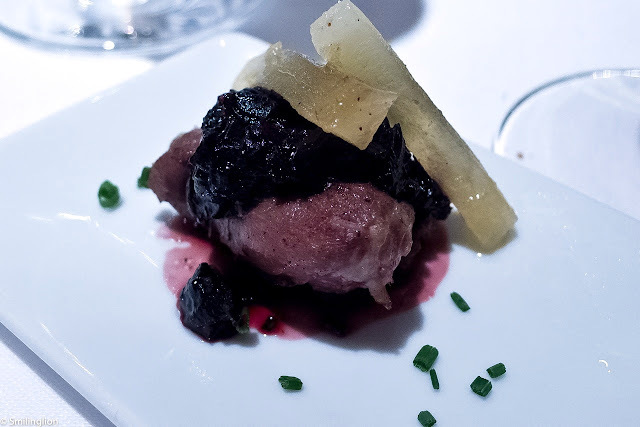 Pigeon leg and hibiscus pudding: The pigeon leg on the other hand was rather forgettable. Beef with vegetable screens: The most bizarre dish of the evening was the steak presented on a TV screen on which was an animation of a blue flame. 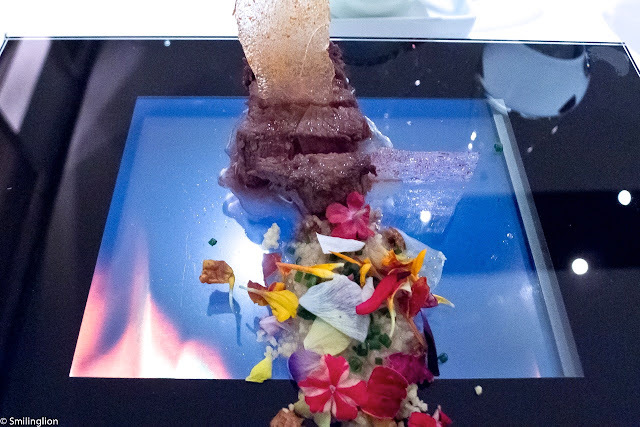 The dish was ok but it was just weird eating food off what looked like an iPad. We really didn't see the point of it. 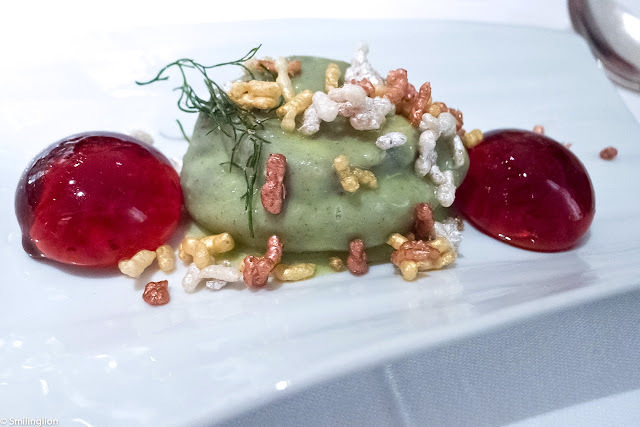 Roots, fruits and seeds: A puzzling dessert made of a mousse and globules of liquid fruit and with flavoured rice crispies sprinkled over them. 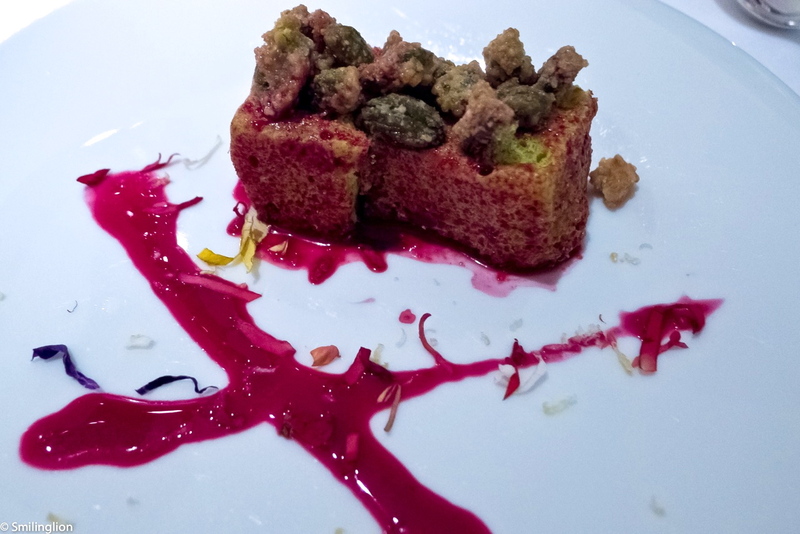 Pistachio and beetroot stone: This was also disappointing. The bread/cake was hard and the pistachios tasted too salty. 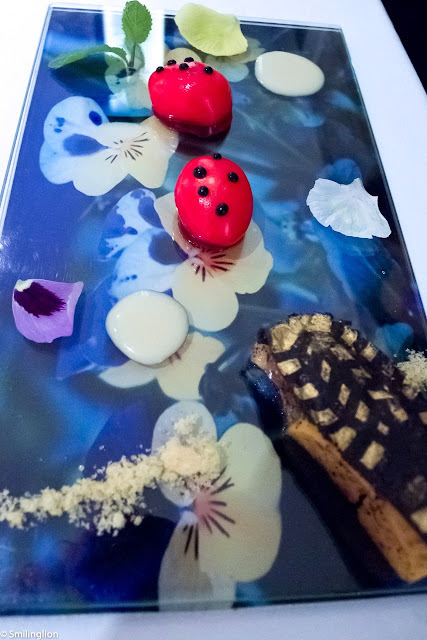 Golden footprint and ladybird: This looked nice but we retained no impression of this dessert. 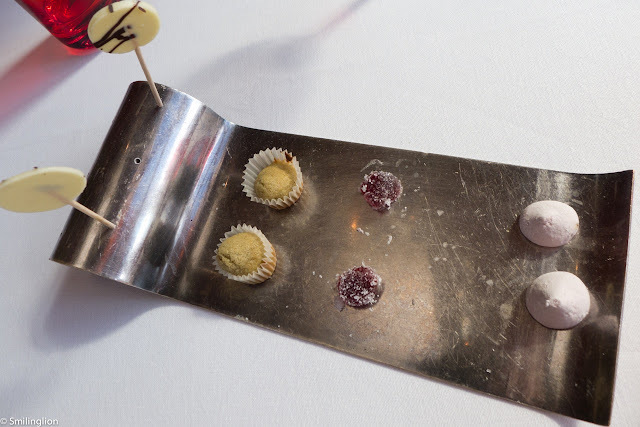 We didn't touch the petit fours. 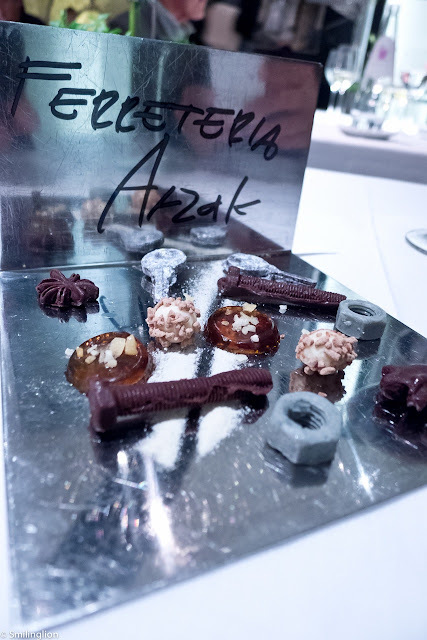 Impressions: We were bewildered by our meal at Arzak. Despite the presence of both Chefs Juan Mari and Elena, the food was oddly inconsistent and we found ourselves adversely distracted by the unnecessary props and gimmicks used to accompany the food. 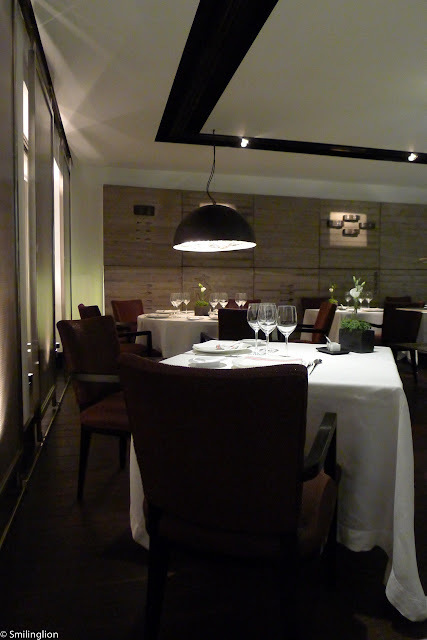 There was nothing really blatantly wrong with our meal, it was just that somehow we could not grasp many of the ideas and flavours which the chefs were trying to impress upon us, and though service was very good and we enjoyed our wines, the meal was rather anti-climatic (especially given the standing of this restaurant and the cost of our meal). 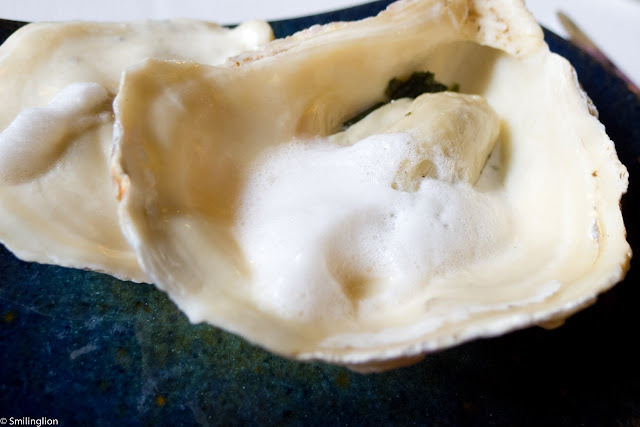 Nestled in the mountainous region of Biscay in the Basque Country is a gem of a restaurant which we heard was worth the ninety minute drive from San Sebastian (where we were staying) to dine at. 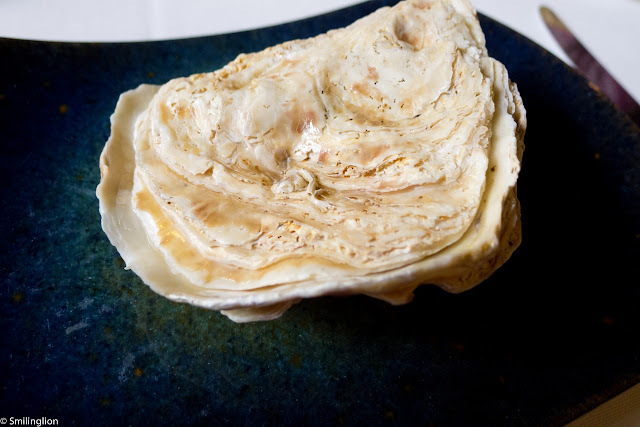 The star of this establishment is its wood-fired grill presided over by Chef Victor Arguinzoniz, who uses different types of wood to create variations of flavour for the food which passes over his grill. 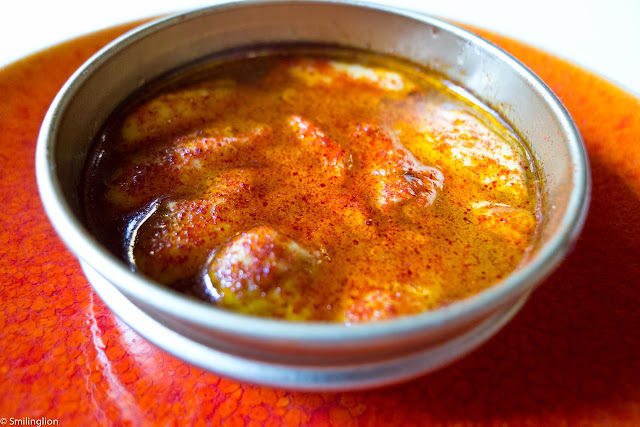 The rustic 'asador' (a barbeque restaurant) has one Michelin star, which speaks more about how highly regarded the food here is than to the other aspects of how the Red Book judges restaurants. The drive south from San Sebastian was long but very scenic especially after we entered the hilly terrain near to our destination. 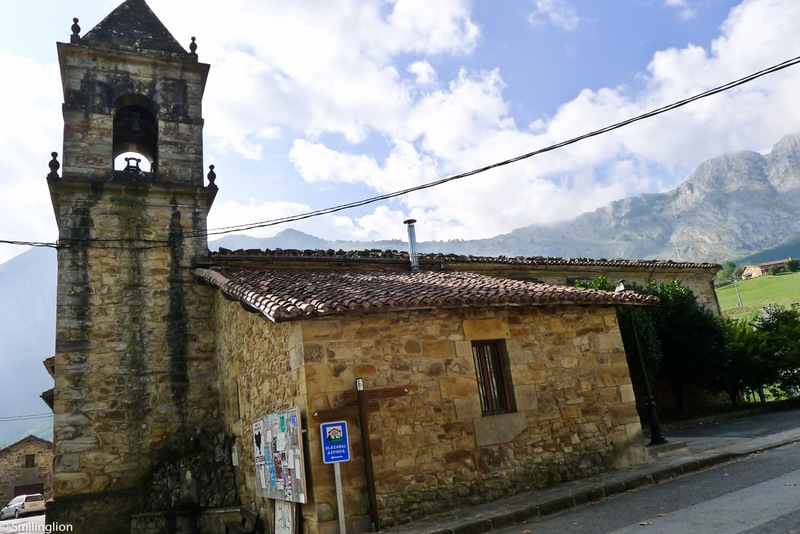 We arrived early, before the restaurant opened, but was grateful for the chance to stroll around the very small hamlet enjoying the refreshing air of the mountains and the peace and quiet of the countryside. 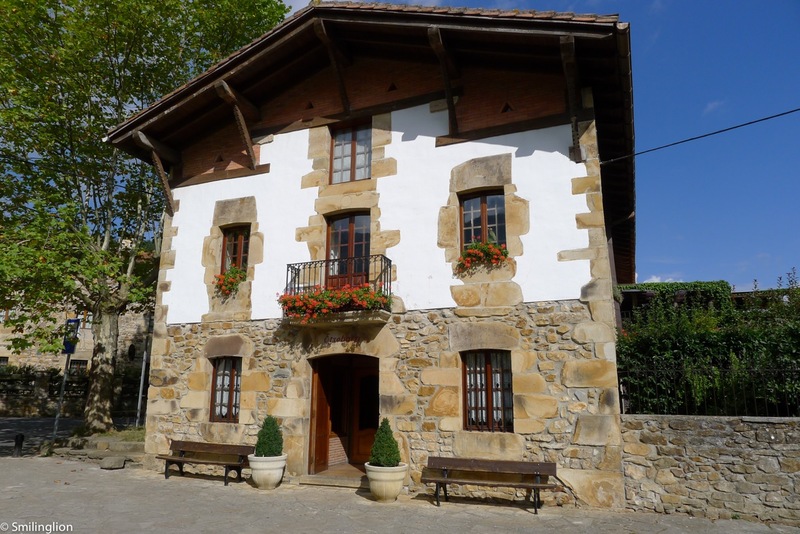 Asador Etxebarri is set in a two-story stonehouse which interior reminded us of an old-fashioned country inn. We were its first guests for the day so were brought upstairs to the main dining room and given the choice of the tables in the room. We took the corner one which afforded us a view of the mountains through the window. The menu looked quite simple but to makes things easy, we opted for the tasting menu, which was a selection of the most popular dishes. 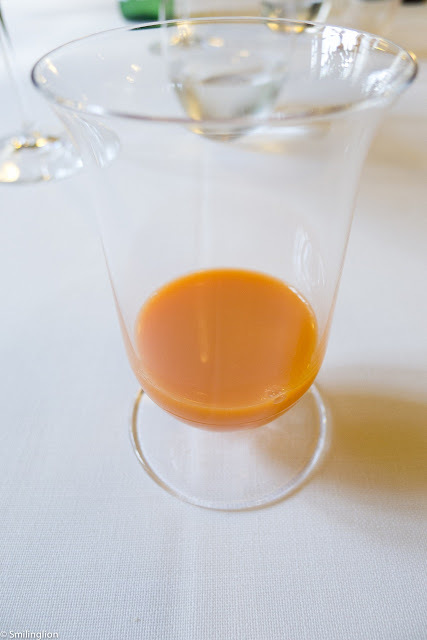 We started with the Carrot Juice, which was a simple gazpacho. The few pieces of Chorizo elaborated from acorn-fed pork were full of flavour. 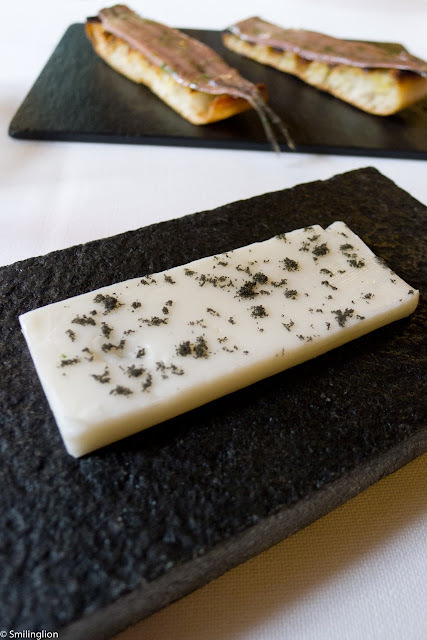 Butter with goat's milk and black salt with salted anchovies with toasted bread: The butter was smoked and we couldn't have enough of it. 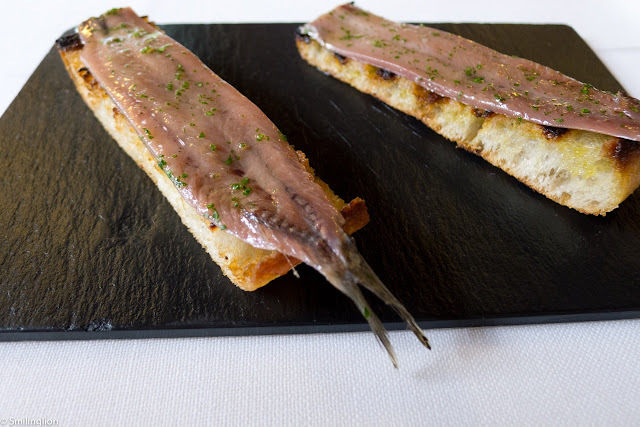 The anchovies tapas were good but what was really special was the way the bread underneath was grilled. 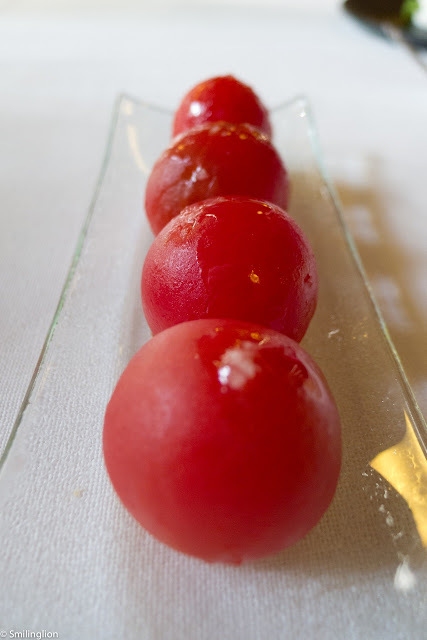 Buffalo mozzarella and cherry tomato. 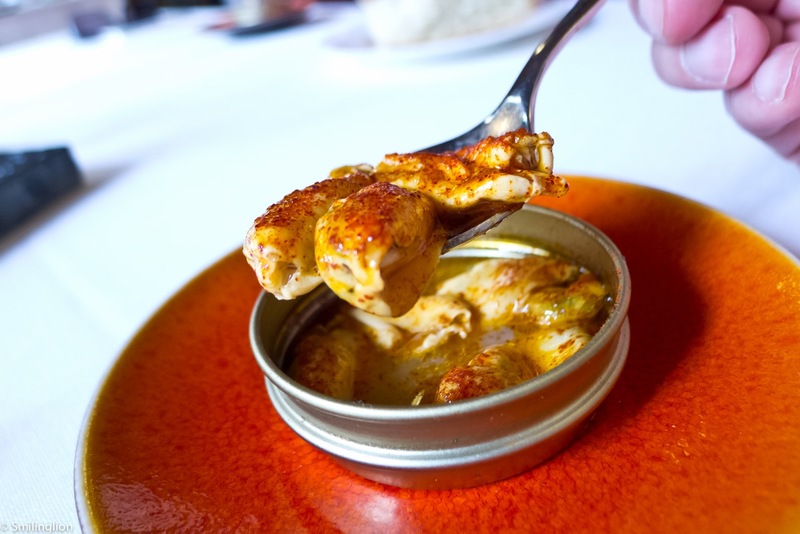 Mussels in escabeche: This classic Spanish dish of mussels poached in vinegar was very good. Prawns from Palamos: These were very large and fresh prawns which were grilled in such a way as not to burn the skin (i.e. probably grilled over low heat). They were quite brilliant. 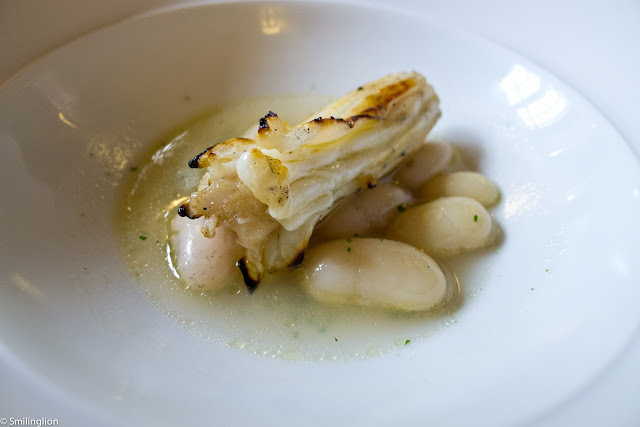 Sea cucumber with fresh white beans. 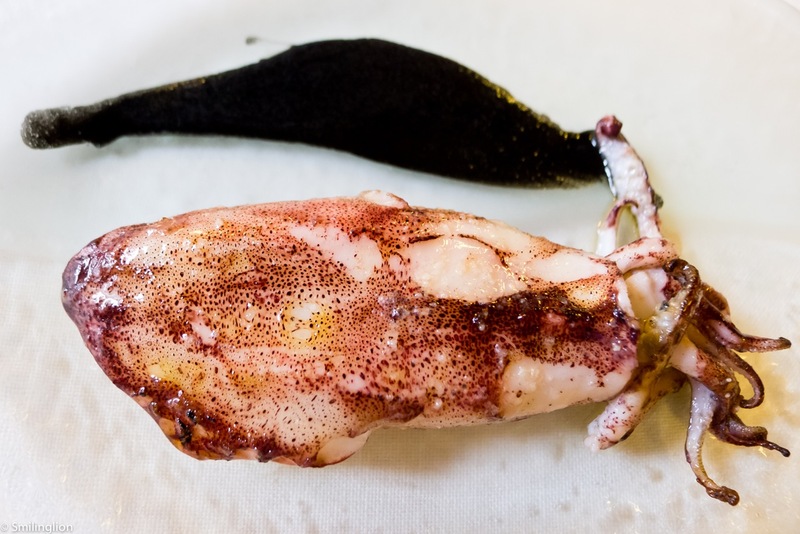 Baby squid: This was a subtlety and lightly grilled squid accompanied by its own black ink. 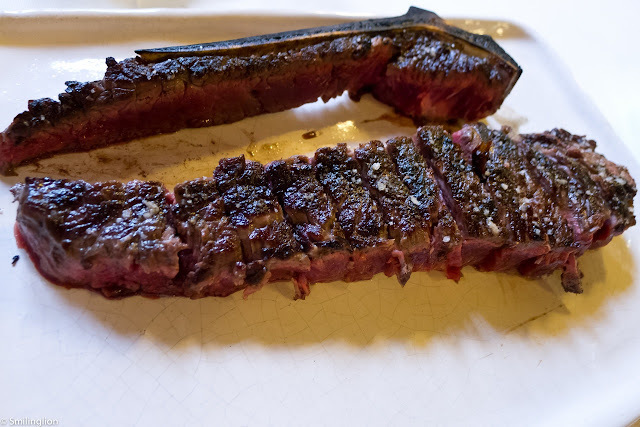 Beef chop of Galician beef: The iconic Galician bone-in steak, grilled to perfection. It was one of the best pieces of beef we had ever eaten. 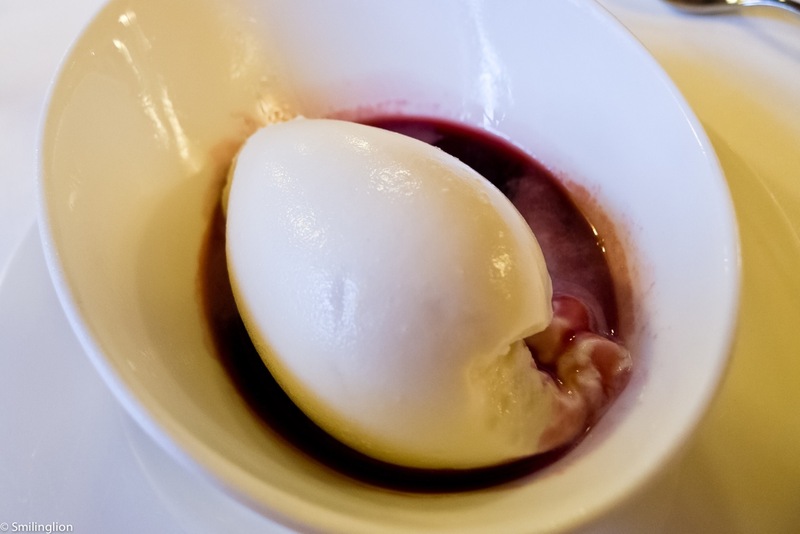 Reduced milk ice cream with red fruit infusion: Chef Victor's obsession with his grill knew no bounds. 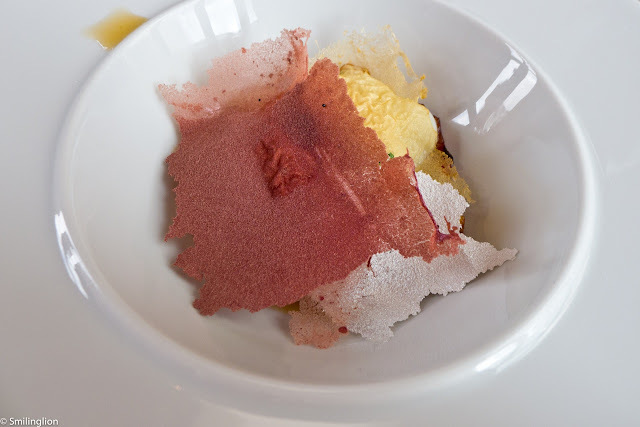 Even his ice cream was smoked, to very unique and interesting results. We never knew simple milk ice cream flavoured with ash tasted so good. 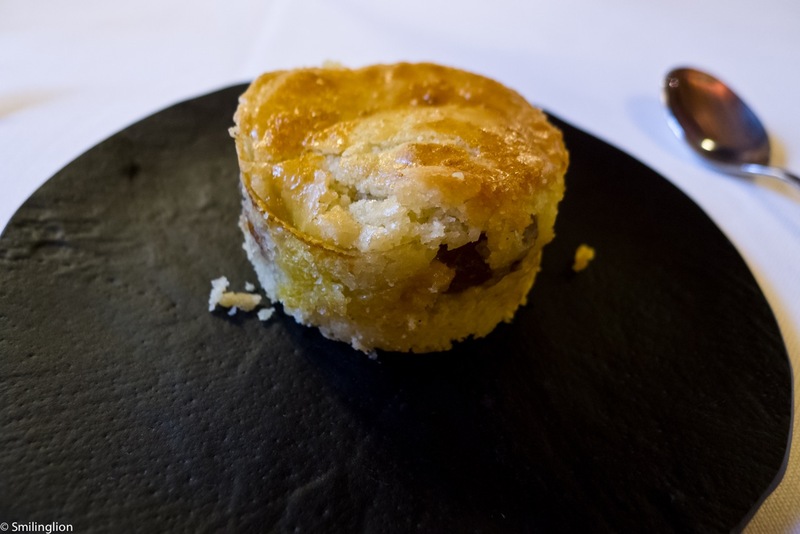 Basque cake with figs: This was a very simple local dessert, followed by some slightly burnt madeleines for our mignardises. 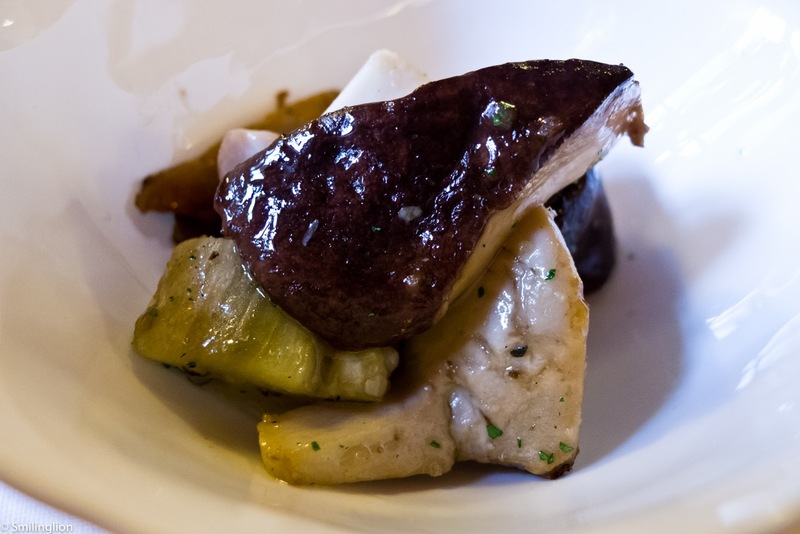 Impressions: The remote location and gorgeous surrounds of Etxebarri, coupled with the very special grill and in particular the steak, makes this restaurant a must-visit when in the Basque region. 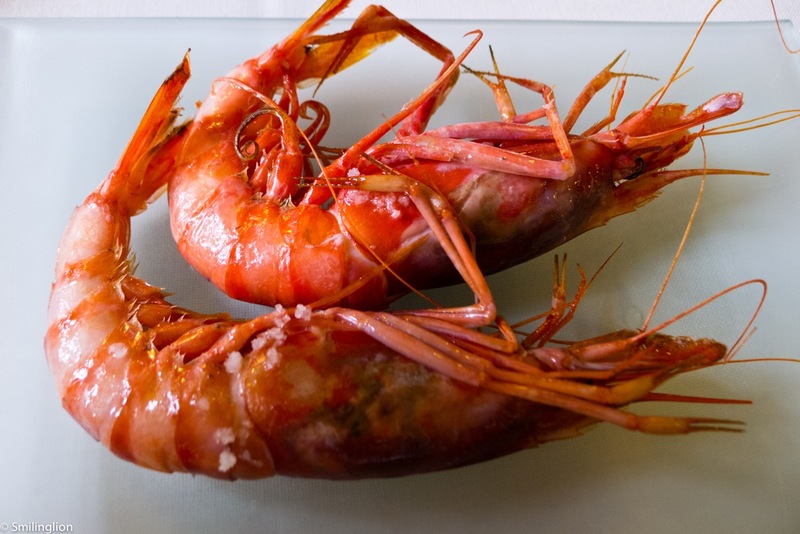 The use of the wood-fired grill was very unique and resulted in a unforgettable smoky flavour of most of the dishes (although they were all otherwise cooked very simply). 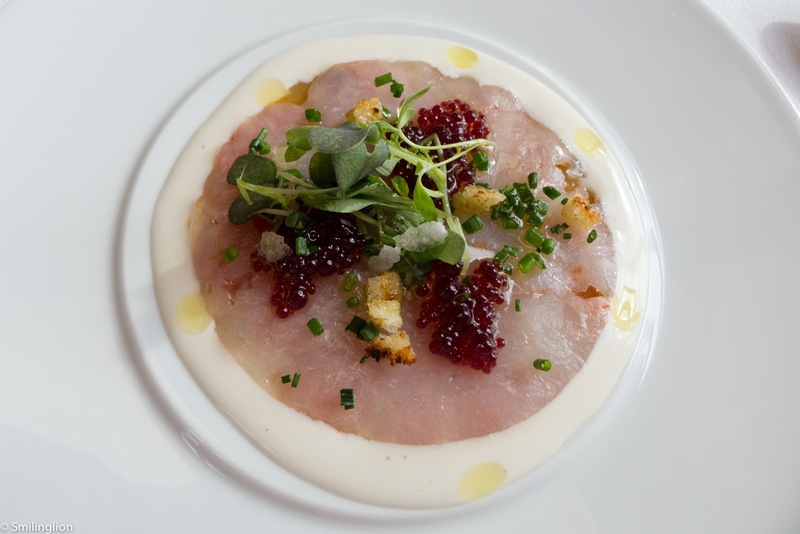 This was a family-run establishment and service was friendly without being particularly slick. On another day (it was raining shortly after we started our lunch), it would have been wonderful to have dined in the balcony facing the stunning views of the mountains.